Advanced CSV Converter allows you convert CSV files to DBF, Excel spreadsheet (XLS, XLSX), TXT, SQL, XML, Fixed Text and RTF. Convert CSV to 10+ formats. Advanced CSV Converter lets you convert a CSV file to DBF (dBase III/IV, Visual Foxpro), Excel files:XLS,XLSX, SQL, TXT, Fixed Width Text, HTML, PRG, XML, RTF, TSV. Often, you don't need all of the records exported from CSV. To filter out what should be exported and what not, Advanced CSV Converter features customizable filters to perform certain queries based on the given sample, or set a conversion filter. What if you have hundreds of CSV files? Would it not be madness to convert them manually? Take Advanced CSV Converter instead, and it will deal with all of them in just one go. Simply specify the folder where those CSV files are. With Advanced CSV Converter you can use all of its capabilities from the command line. This allows you to schedule and automate CSV conversion or write complex scenarios using third-party tools. Regardless of encoding, delimiter settings, formatting and the number of CSV files, the process is always the same with Advanced CSV Converter: pick the file or files, select the output format and the destination folder, configure conversion settings. Just three steps and you're done! Save on buying multiple apps. The app is versatile and all-functional. When usually you need to buy multiple tools to deal with multiple formats, Advanced CSV Converter lets you save on buying other apps. It works absolutely independently on any third-party tools and libraries. It doesn't need ODBC or BDE to function. And it feature effortless CSV conversion to 10 formats with exhilarating speed. Convert extra huge CSV and Text files (> 4GB). 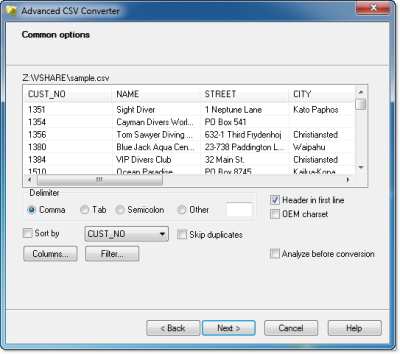 Updated: February 20, 2019 Advanced CSV Converter v6.75 released! Here You can subscribe to the CSV Converter mailing list, where we will provide you with latest information about upgrades and other topics concerning this program .